Bundling up your application into a Docker container has many benefits including making deployments really easy without being bound to a particular cloud host. In this post we will containerize a .NET Core application and deploy it using Docker. Before we can get started we need a couple of dependencies installed. Make sure you have the latest .NET Core SDK installed. You can download the SDK for your operating system on the project page. In order to be able to run the Docker containers locally we also need to install Docker. You can find the instructions for your respective operating system on the Docker website. 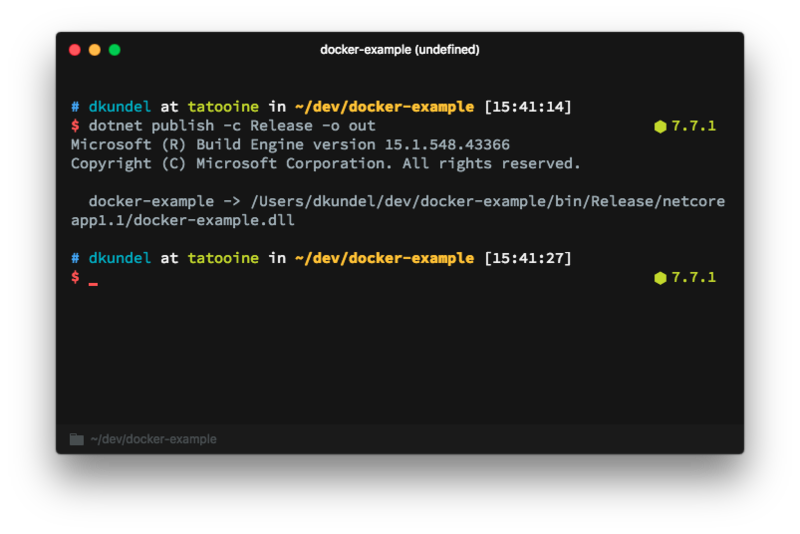 If you are like me using Visual Studio Code as a code editor, you should also check out the Docker extension. Once it is saying Now listening on: http://localhost:5000 navigate to http://localhost:5000 in your browser and you should see a Hello World message on the screen. You can shut down the application now by pressing Ctrl+C in your command-line. 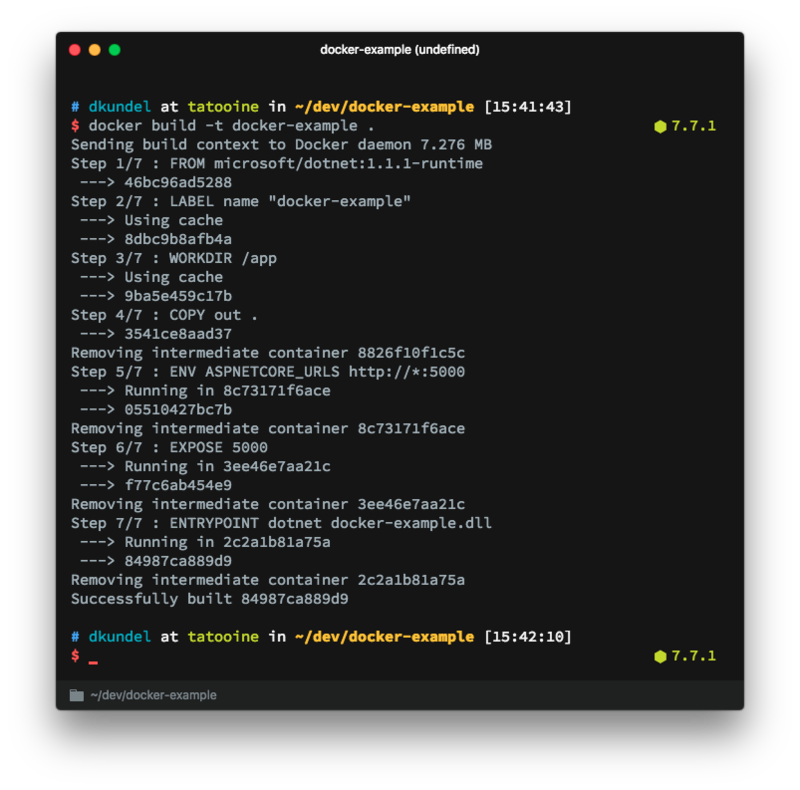 Now that we have an application we need to “dockerize” it by creating a Dockerfile. A Dockerfile is used to describe a Docker application, also called a container. It describes what is necessary to get your application running. This includes which operating system to use, setting up the directories, copying your application code into the container etc. Luckily we do not have to reinvent the wheel for every application we use Docker for. We can always derive our Dockerfile from another existing image as a base image. There are hundreds of thousands of container images on Docker Hub that we could use as base image. For our project we will be using the microsoft/dotnet image as our base image. Microsoft provides different versions of this image that are partially denoted with suffixes such as runtime or sdk. sdk is an image that will come with the full .NET Core SDK which means you could create or build applications with this image. This is useful for development but not for production. 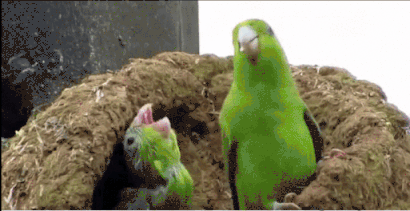 The more lightweight version of the image is tagged with runtime. It only includes the bits necessary in order to run a .NET Core app. It ultimately results in a smaller sized container image with 251 MB compared to 879 MB for the version 1.1.1. In this blog post we will be using the runtime image. This will define our base image as the 1.1.1-runtime version of the microsoft/dotnet image. The base image will handle things from setting up the operating system to installing the runtime. Lastly we need to start up our .NET application by using the dotnet executable and pass it the DLL with the name of our application (docker-example.dll). That’s it our Dockerfile is ready to take a local spin. docker build -t docker-example . 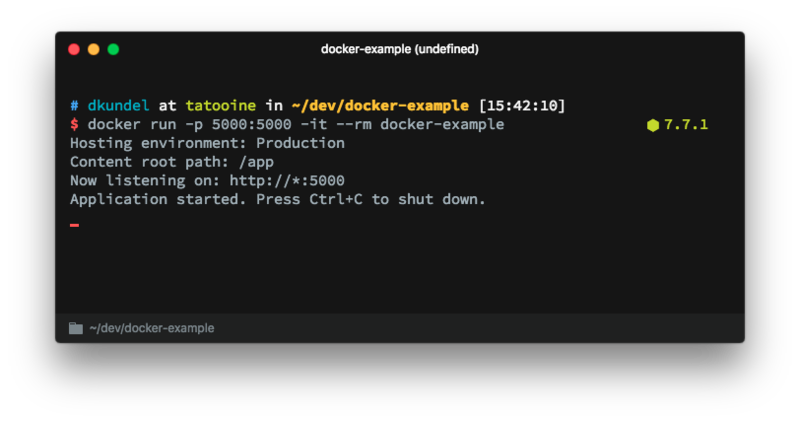 This command will run our docker-example container in “interactive” mode meaning it will output the console output, additionally it will map the exposed port 5000 of our container to our localhost port 5000 and the --rm will make sure to remove the Docker container when we quit the application using Ctrl+C. 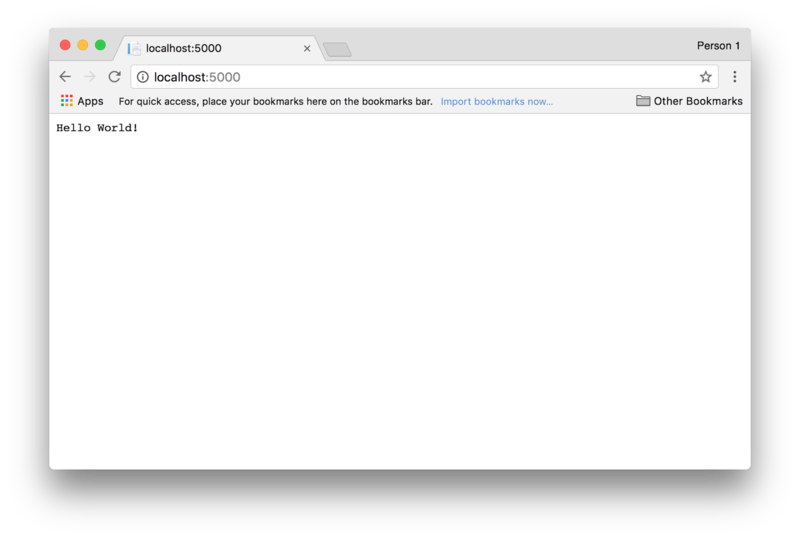 You should now be able to go again to https://localhost:5000 and see Hello World. 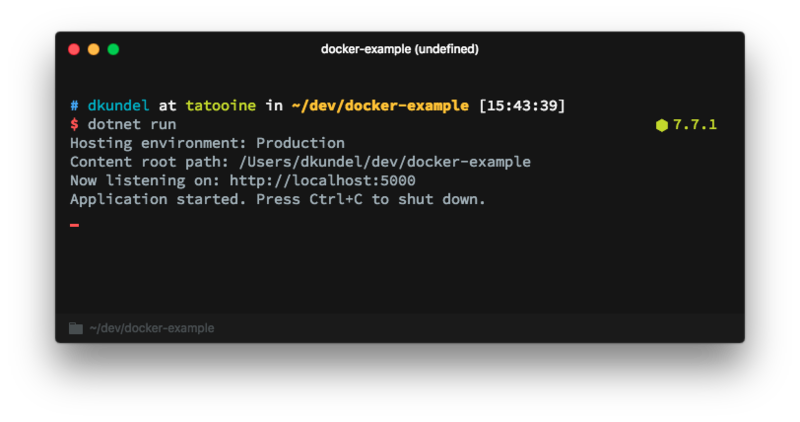 If everything is working you can stop the Docker container by exiting it using Ctrl+C. Our Docker container is ready and it’s time to deploy it to the cloud. The great thing is that we can run this container on various cloud hosts by uploading our built container image into a registry like Docker Hub and then instructing a cloud host like Azure to deploy the respective container image. We will look at an alternative though. now.sh is a cloud hosting platform that allows us to easily deploy Docker project. The great thing is that it doesn’t require you to build the container image on your computer or host it in any registry. Instead it will build the container for you in the cloud. Additionally it will take care of scaling and host it on Google Cloud Engine as well as Amazon Web Services. A warning in advance: The free plan of now is designed for open source projects. As part of that it will enable you to inspect the source of your application by going to /_src on your deployed project to inspect the source. Meaning only use this free plan if you are deploying an application without sensitive data. Sensitive data should be stored in secrets and loaded via environment variables. To start with now install the CLI or alternatively the now Desktop application (which includes the CLI) from now’s download page. Once it’s installed and you are registered it’s time to deploy our app. That’s it! It will upload your source code, build the Docker container image and deploy it. It will also copy a URL to your clipboard that your application will be hosted on. It should be of the format: https://docker-example-xxxxxxxxxx.now.sh. While your application is being deployed you will also see the status of your deployment on this page. 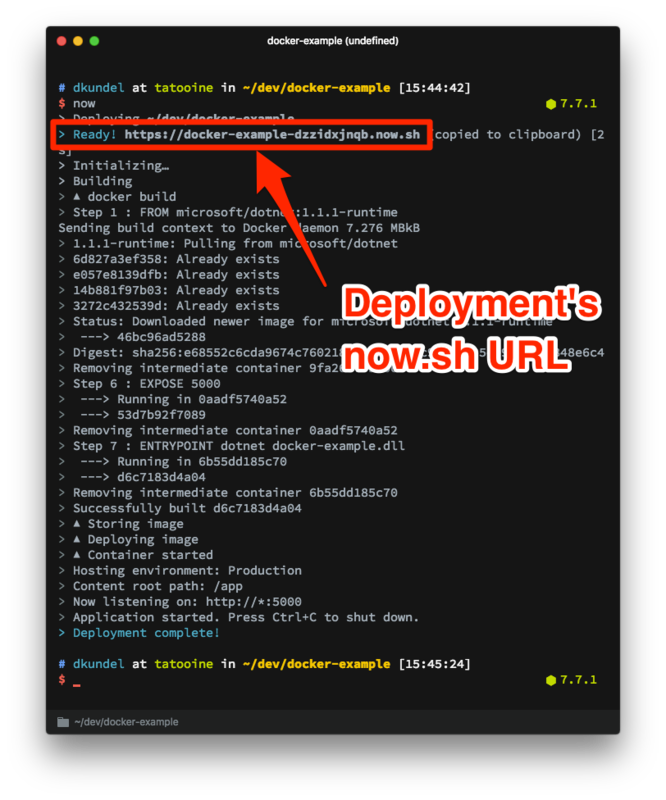 This will result in mapping your deployment docker-example-xxxxxxxxxx to https://myamazingdockerapp.now.sh. On the paid plan you can also use custom domains and it auto sets up HTTPS for you as well. That’s it! We are done. We took a .NET Core application from our computer to the cloud using Docker! Being able to run .NET Core virtually anywhere is pretty exciting to for me and I would love to hear what your experience is! Let me know if you have any questions or built something cool you want to show off. I can’t wait to see what you built!